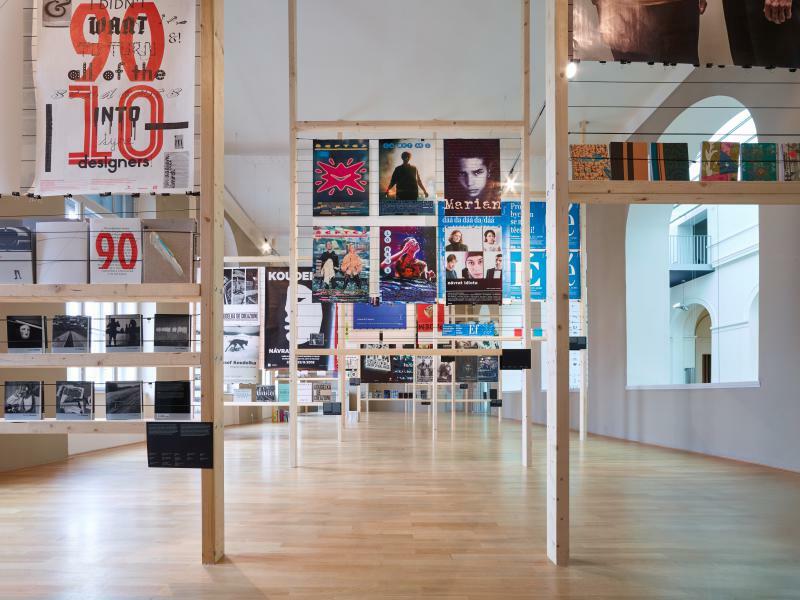 The programme of accompanying exhibitions reflects the democratic spectrum of the main competition, and presents a variety of approaches across the vast landscape of contemporary graphic design, from alternative and conceptual paths to quality corporate design, advertising and other areas of graphic design. Each show will introduce graphic design from a different perspective. While the retrospective of František Štorm will present typeface design and design connected with music, Aleš Najbrt’s monographic exhibition will map his artistic development as a leading exponent in Czech graphic design. The Age of Independence is a new take on a traditional graphic medium, the magazine. The Time and Motion exhibition will focus on motion design and its relationship with graphic design. The Okolo creative group, the Biennial curators, were in charge of three accompanying shows. In Between Area and Space they examine the links between graphic and product design, while in the documentary installation Porto they observe graphic design from the geographical perspective. In the last exhibition Out of the Box the curators asked several professionals to share their views on graphic design. Graphic design in František Štorm’s life falls between typeface design and free art. The artist creates typefaces commissioned by clients, as well as for his own projects. Since 2008 when he left the academic milieu, Štorm has been an active musician, and designs the covers of all his CDs, as well as merchandise and stage components. Typography logically accompanies all of Štorm’s activities, and forms the axis of the installation prepared on the occasion of František Štorm receiving an award for his lifetime contribution to graphic design. The exhibition is divided into theme sections conceived by the artist in collaboration with the curator Vladimir 518. Each section contains various elements, artefacts, drawings, matrices and typeface specimens surrounding a realization of a particular character. Naturally, the show will also comprise illustrations to which František Štorm has inclined recently, more so than to the design of fonts. These will be presented as well, in the form of selected sample books Storm Type Foundry of the last 25 years. The central section of the room will feature a “table” – a horizontal display case with examples of the artist’s book and magazine design. The shorter side of the room will be devoted to the video projection of art experiments connected with music. The exhibition will also include the artist’s drawings and paintings accompanying his songs. Beyond doubt, Aleš Najbrt is the best-known Czech graphic designer. For many people, the name of his studio is synonymous with graphic design as such, due to the artist’s numerous film and theatre posters, design of the Reflex magazine, visual identify of Prague and Ostrava and over twenty years of collaboration with the Karlovy Vary film festival. However, the main objective of his retrospective is introduction: an introduction of Aleš Najbrt as a person with whom people do not usually realise how ubiquitous he is, and for how long they have lived with him; introduction of a creative platform comprising twenty artists led by Najbrt together with Zuzana Lednická (who actually lives with him in real life); introduction in the sense of Najbrt’s abundant activities of performer and for performers, and finally, perhaps also an introduction of the period and design profession in general. The exhibition charts Najbrt’s work from his graphic design beginnings in the 1980s through art direction of Reflex and Raut magazines, to the change and multiplication of his artistic identity in a graphic studio established after 1994. The journey of designer Aleš Najbrt to the Najbrt brand involves work for the film industry, extensive collaboration with Josef Koudelka and campaigns for the Prague Spring festival and the Czech Philharmonic. The volume, the lasting and the effect of Najbrt’s executions and his long-term prominent position as the mastermind of the main visual stream, a sort of a “designer of our time”, prompt to read the exhibition also as a picture story of post-revolution transformation. Driven by passion and enabled by technology, today’s independent magazines are the product of a new creative age. Lauded for their analogue beauty, these carefully crafted print titles could not exist without Apple, Google and the other tech giants that massively disrupted the media landscape at the start of the 21st century. Just a generation ago, the process of creating and printing magazines included many specialist skills and pieces of equipment, but today anyone with a phone, a laptop and an internet connection possesses all the tools they need to create their own independent magazine. The result is a new wave of beautiful, provocative and idiosyncratic magazines made for tight niches rather than broad demographics, and the titles assembled in this exhibition represent a selection of the most eye-catching and interesting publishing from the last two years. The exhibition arranges them in groups to show some of the similarities and differences that exist between them, but it’s important to remember that they are first and foremost independent: They may feel affinities for one another’s work, and may even look to each other for support and inspiration, but they are each publishing according to their own ideas and experiences, and answer only to their own passions and priorities. Motion design represents a distinctive and dynamic intersection of animation, graphic design, film, video, special effects and new technologies. It is part of TV jingles, commercials, graphic sequences in films, website animations and user interfaces, as well as various installations and displays. However, motion design is not simply graphics in motion. The time element and the constant flow of changes provide this form of visual communication with a unique and characteristic narrative component. Motion design once responded to the emerging need for a new visual form, for example, in the case of film credits, TV branding and contemporary website animations and in mobile applications. At the same time, it came to the fore as a new genre on the basis of experiments with fresh means of expression, for example, in abstract projections and visual essays. 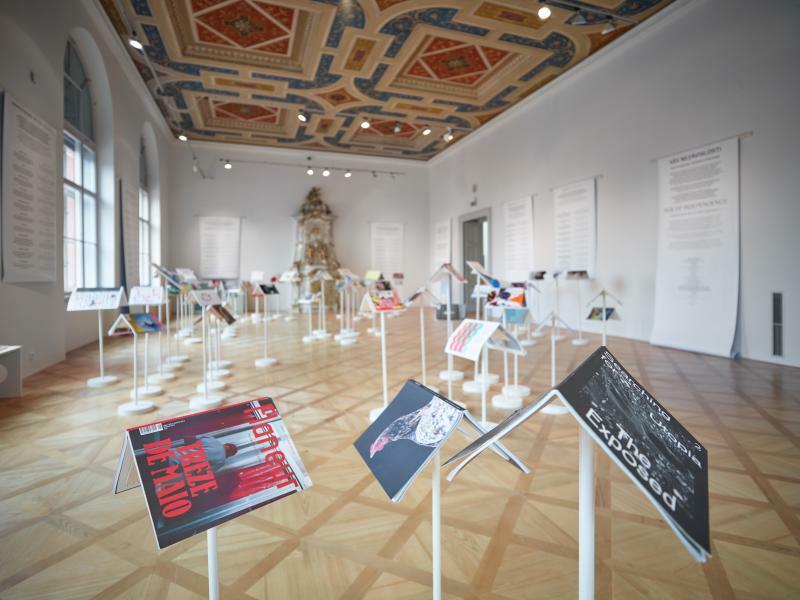 The exhibition concept is the work of the Oficina studio, one of the pioneers of motion design in the Czech milieu. The studio also organises the acclaimed Mouvo motion design festival. The projection presents motion design in its multiple forms, as well as in its historical context. It introduces motion design as an organised creative discipline, as well as a dynamic and unmistakeable manner of personal expression. Curators of this year’s Biennial from the OKOLO group set out to investigate and map the creative milieu of the Portuguese city of Porto focusing chiefly on graphic design, yet with overlaps into product design, architecture, illustration, crafts and the culture and history of the city. The project is based on the group’s experience with the publishing of its own magazines and the European Design Stories project. In the course of one week they visited almost 20 graphic studios in the city and documented their production, both visually and in texts. The selected designers will include João Machado, one of the luminaries of the discipline, as well as budding artists, for example, from the Degrau and Non-Verbal Club studios. On their journey the curators also viewed a large number of examples of modern and contemporary architecture, got acquainted with local illustrators and product designers and captured the city’s overall atmosphere. The result is an exhibition with a unified concept showcasing the dynamic graphic scene in one city within a particular context. The exhibition will present artefacts and works by designers, as well as photographs taken by the OKOLO team in collaboration with photographer Tomáš Souček. 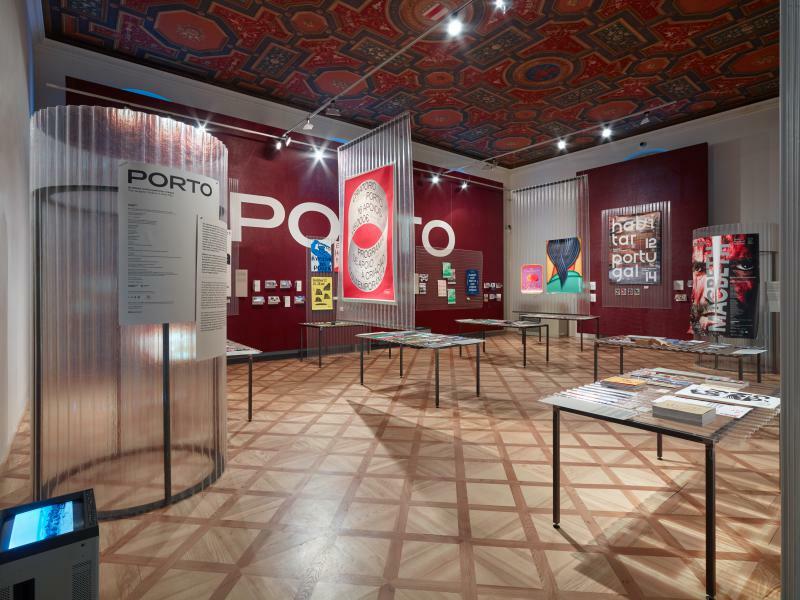 The exhibition Porto: The graphic scene in one city is held in collaboration with the Office of the Deputy of Smart City. Different creative disciplines exist alongside each other and more or less overlap, while influencing one another. Even the work of specialised designers often stretches into other branches and invigorates them with fresh, unbiased approaches. Between Area and Space assesses the blending of two autonomous disciplines, graphic and product design, seeking links between these related branches which, with a bit of exaggeration, only differ through the space which they inhabit. A comprehensive selection of objects and graphics reflecting this subject from multiple angles resulted in a striking series of projects, bringing together artists who would, under different circumstances, probably never share the same exhibition space. The exhibition is divided into several theme sections devoted to eminent designers and distinct design phenomena. It will introduce the work of artists active in both disciplines, designers who employ graphic strategies in product design, or conversely, graphic materials in the field of product design. The selection is based on the varied nature of the two disciplines, their subjects, forms and time periods. 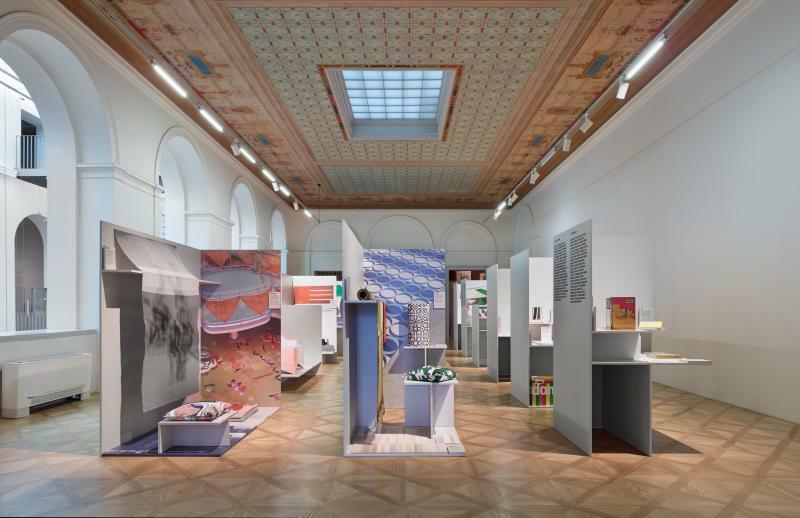 The show will thus feature the work of such design legends as Max Bill, Josef Hoffmann and Stefan Sagmeister, as well as young and less-known graphic designers mainly active in product and interior design. 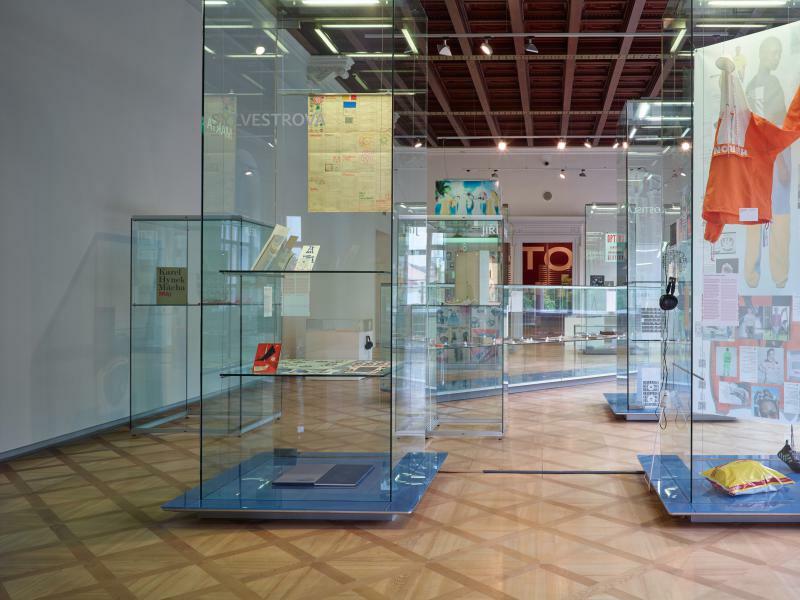 The display case as a symbol of a museum exhibition turns in the Out of the Box show into an open exhibition space that will be appropriated by guest artists from creative disciplines associated with graphic design, in different ways sharing the graphic design subject. Each display case will present a personal attitude and a specific selection regarding a particular artist or designer, their production, theory, curatorship, collecting activities, photographs, visual art, architecture, design or fashion. 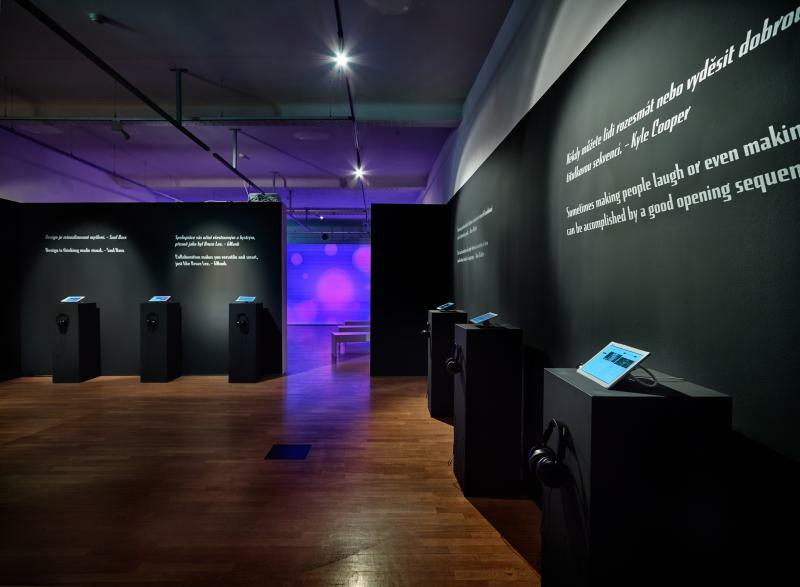 These small displays with comments make up personal statements about contemporary graphic design, from many of its perspectives. Out of the Box thus actually stages several exhibitions in one, a number of different and surprising approaches reflecting the interests and output of the artists involved. 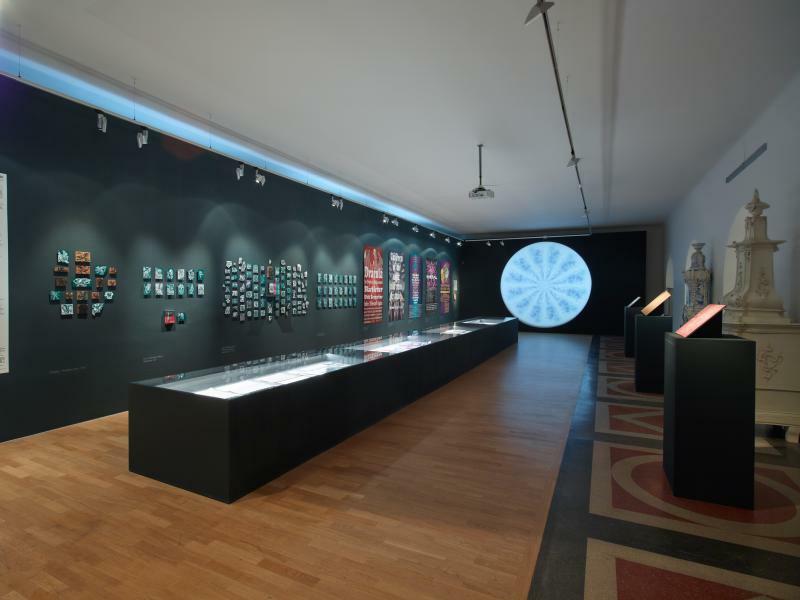 The exhibition resembles a scattered mosaic offering facts and visual stimuli in many forms. The “curators” of the individual display cases will include figures such as Lars Harmsen, editor of the Slanted magazine and member of the international jury of this year’s Biennial, graphic design historian Marta Sylvestrová, curator Monika Čejková and graphic designer Fraser Muggeridge, as well as the Instagram profile Posters of Prague and many others.